Probate is the transfer of assets and payment of debts of a decedent under the supervision of a judge. This Tip Sheet by Mark W. Bidwell, explains the probate process in California. Probate is a set of California laws on who inherits and how to inherit. In California a set of laws determine how a decedent’s assets are transferred and how a decedent’s debts are paid. This set of laws is referred to as the “Probate Code.” Courts that enforce the probate code are referred to as probate courts. This Tip Sheet by Mark W. Bidwell, a licensed attorney in California, provides an over view of the probate process. A decedent’s assets are either in an “intestate estate” or a “testate estate.” A “testate estate” is created when prior to death, a decedent creates a writing that identifies persons who are to receive assets of the estate. Examples of writings are wills, trusts and deeds. Trusts and deeds are created to avoid probate court but may require resolution in the probate court. An “intestate estate” is created when there is no writing or document. Without a writing, persons who are to inherit from the estate are determined by California probate law. The law has priorities for inheritance. First to inherit is the spouse, then if no surviving spouse, surviving children or grandchildren inherit. If no spouse or decedents survive, then parents of the decedent inherit. If no parents survive, then surviving siblings inherit and so on. The probate process begins with the filing by a person of interest, a petition for the court to appoint a personal representative of the decedent. Upon receipt of the petition the court sets a date for a hearing to appoint the personal representative. The person who filed the petition must provide notice of the hearing to heirs by writing and notice to the general public by publication in a newspaper. At the hearing and if no one objects, the personal representative is appointed and “Letters” are issued. The letters are signed and certified by the court. The “Letters” authorize the personal representative to gather all assets and to pay all just debts. After the “Letters” are issued the personal representative has four months to identify all assets and have those assets appraised. At the end of four months and if all creditors have been paid the personal representative files a second petition. This second petition provides an accounting of all transactions in the estate, a proposal for distribution of assets of the estate, for authority to pay the personal representative’s fees and for authority to pay attorney fees of the estate. Upon receipt of this petition the court set a date for hearing on the second petition. At the hearing and if no one objects, the court approves the accounting, orders for the distribution of the estate’s assets and orders payment of fees. Probate is section of the California law that directs how assets of a decedent are to be distributed and how creditors are to be paid. The probate process is under the supervision of the probate court. 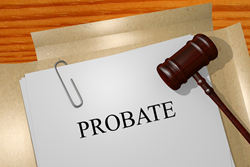 Probate takes about one year and requires at least two court hearings. This Tip Sheet was authored by Mark W. Bidwell, an attorney in Orange County, California, who specializes in probate and trust law. Mr. Bidwell’s office is located at 4952 Warner Avenue, Suite 235, Huntington Beach, CA 92649. Phone number is 714-846-2888. Mr. Bidwell markets primarily through a website, http://www.DeedandRecord.com.